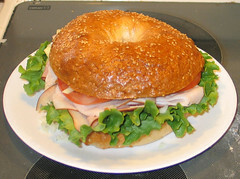 In case you were wondering, this is what happened to the giant bagel. It is sitting on a typical 10" dinner plate. Two really big pieces of lettuce, 3 slices of provolone, 6 slices of lunch meat, three slices of tomato, a scattering of onion and some mustard. It fed a family of four for lunch/snack time.